Great attention to modern function and storage was given to the Edge Water credenza. Store your audio/video equipment behind protective glass doors. The bottom drawer serves as hidden storage for your CD’s, DVD’s or gaming equipment. The deep black finish not only highlights the TV’s of today it is easily accepted into any decor. Stylish, functional, and easy on the eyes. This lift-top coffee table from the Edge Water collection is the perfect addition for your home. The top lifts up and forward creating a multipurpose work surface so you can work on your laptop, play on your tablet, or eat while watching the news all while relaxing on your couch. Other features include hidden storage beneath the top and open shelves for blankets or knick-knacks and picture frames. This coffee table is finished on all sides in a classic Estate Black so it can be used anywhere your little heart desires. 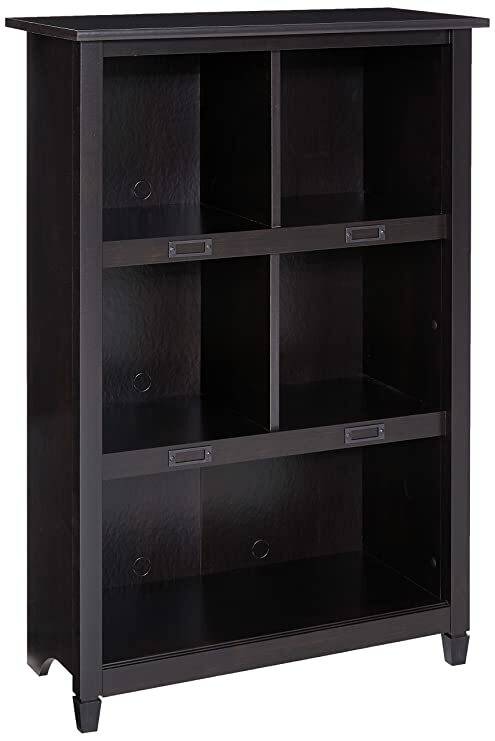 Add some stylish functionality to your home with this bookcase from the Edge Water collection. It features cubbyhole storage perfect for books, binders, bins, photos, collectibles and more! It accommodates ID label tags so you can keep all your goodies organized. 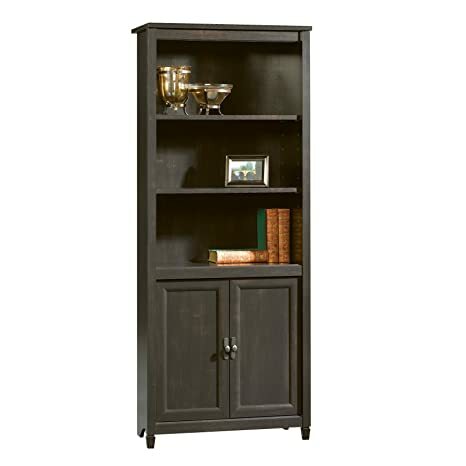 Finished in a classic Estate Black, this bookcase will charm in any room of your home. Time for an entertainment upgrade? Freshen up your living room with this modern cottage inspired entertainment credenza from the Edge Water collection. 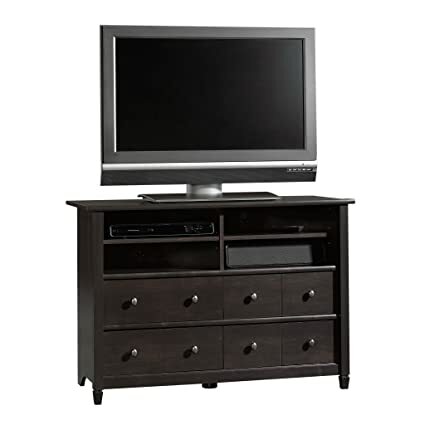 It accommodates up to a 55″ TV, great for a movie night or game day. It includes an adjustable center shelf for video/gaming equipment, two adjustable shelves behind each framed glass door, and one drawer with smooth metal runners. 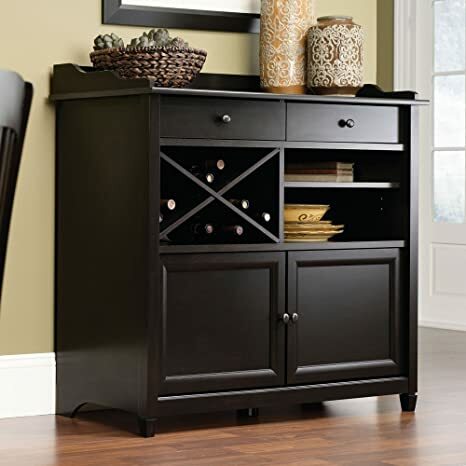 Finished in a striking Estate Black, this stand with give your home that authentic style you’ve been looking for. 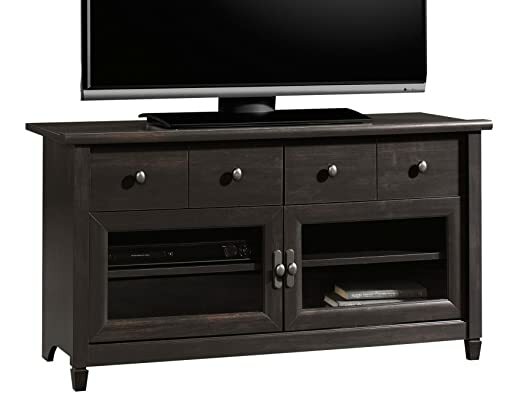 Add some modern functionality and effortless beauty to your home with this Panel TV stand from the Edge Water collection. It accommodates up to a 42 TV so get ready to binge watch your favorite show. It includes two adjustable shelves behind each framed glass door to hold video and gaming consoles along with two drawers that open and close on smooth metal runners. Finished in a handsome Estate Black, this stand is sure to entertain in any room. You get so much more done when everything in your home office is tucked away in its own place. The Sauder Edge Water Executive Desk stores all your office essentials while providing a stylish setting in which to work. 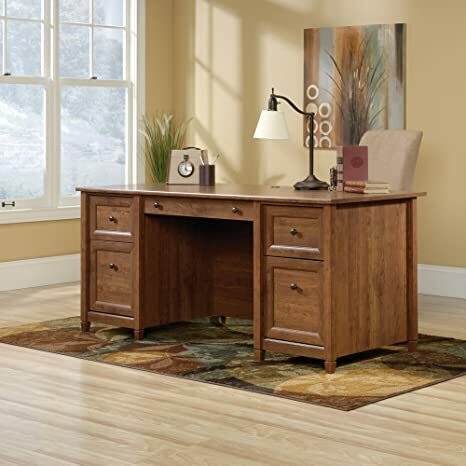 This beautiful desk is constructed of engineered wood and is available of your choice of finish. Its two lower file drawers have full-extension slides and can accommodate letter-size hanging files for maximal organization. Two smaller drawers are equipped with metal runners and safety stops and are the perfect space to tuck away office essentials like pens, pencils, stationery, calculators, and much more. A large drawer in the center of the shelf with a flip-down panel is a great spot to store your keyboard and computer mouse. The desks spacious work surface allows plenty of space to spread out your work, and it even includes a grommet hole to manage computer or phone cords. The traditional design and exceptional function of this gorgeous desk make it a home office dream. About Sauder Sauder is North America’s leading producer of ready-to-assemble (RTA) furniture and the nation’s fifth largest residential furniture manufacturer. Based in Archbold, Ohio, Sauder also sources furniture from a network of quality global partners, including a line of office chairs that complement its residential and light commercial office furniture. Sauder markets more than 30 distinct furniture collections in a full line of RTA furnishings for the home, entertainment, home office, bedroom, kitchen, and storage. Sauder is a privately held, third-generation, family-run business. The company prides itself on its awareness that all function and no fashion makes for a dull living space when it comes to home furnishing products. That’s why Sauder’s award-winning design team has produced more than 25 collections of stylish furniture that span the design spectrum. Work in style! 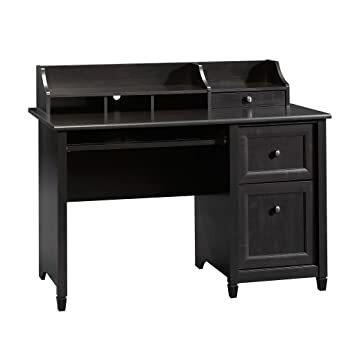 Add some classic beauty to your office with this computer desk from the Edge Water collection. It has a spacious tabletop for all your office essentials laptop, paper, and of course your favorite coffee cup. It features a flip-down molding that reveals a slide-out keyboard/mouse shelf, a storage area behind the door to hold a vertical CPU tower, and two drawers that open and close on smooth metal runners. 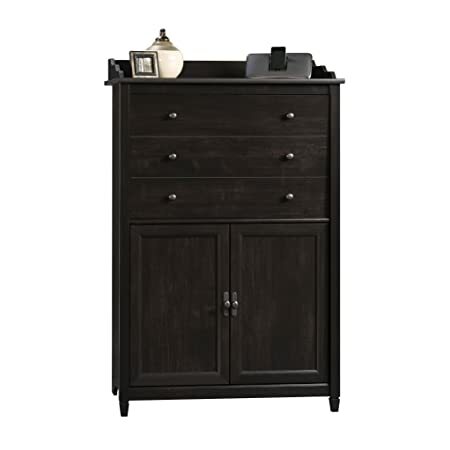 The lower drawer holds letter or European size hanging files! 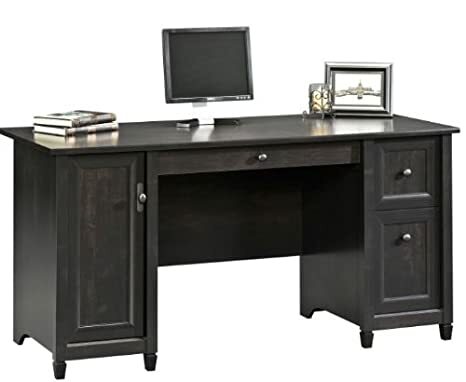 Finished in Estate Black with solid wood accents, this classy desk is just what your office has been looking for. Tired of your living room looking boring and drab? 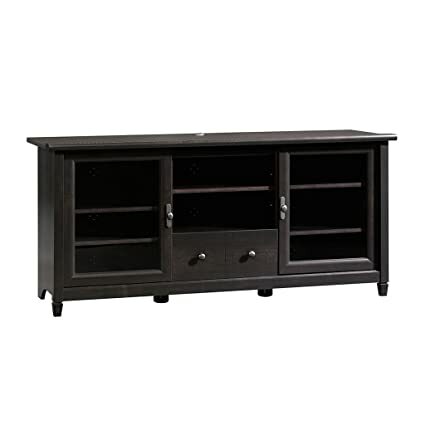 Add some style with this highboy TV stand from the Edge Water collection. It accommodates up to a 47 TV and has two adjustable shelves to hold video and gaming equipment. It also includes four drawers that open and close on smooth metal runners with safety stop features. 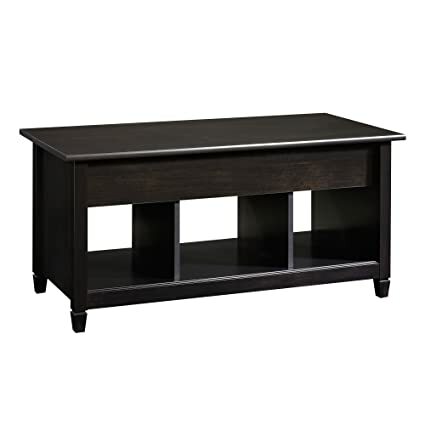 Finished in an Estate Black, this classy console is a good fit for your living room, bedroom, or any other room. This table is big on function and versatility. Use as a pop of color in your living room room, a sturdy nightstand in the bedroom or even a desk for your little artist. This library will serve a useful purpose beside office or entertainment items from the Edge Water collection. However, it is strong enough to stand on its own with solid wood sculpted tapered feet and shapely soft framed doors. The beauty of this collection is behind the clean lines and the use of tasteful dark Spanish hardware.